I enjoy cooking, but the things that really excite me are what I call my “food experiments,” fermented or cultured products that rely on the complex interplay of yeast, bacteria, sugar, and oxygen. 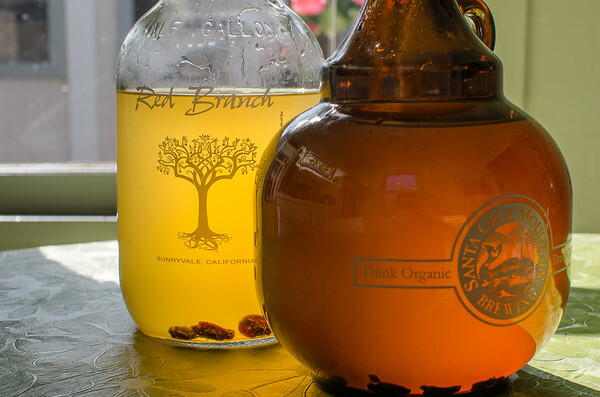 We regularly brew beer, make kombucha (a fermented tea), yogurt, kimchi, pickles, and sauerkraut all from scratch. Each batch is different, you never know exactly how they will turn out. I have a great fermented foods cookbook called Wild Fermentation with these and many other recipes. It’s written by a quirky guy with a big mustache named Sandor Katz. Katz goes by the nickname, “Sandorkraut,” and crafts all kinds of traditional fermented foods and beverages at his home, on a hippy commune somewhere in the mountains of Tennessee. He lives with HIV and considers eating probiotic, fermented and cultured foods essential to his continued health. I’d love to sit down with this guy over a glass of home-brewed kombucha one day! 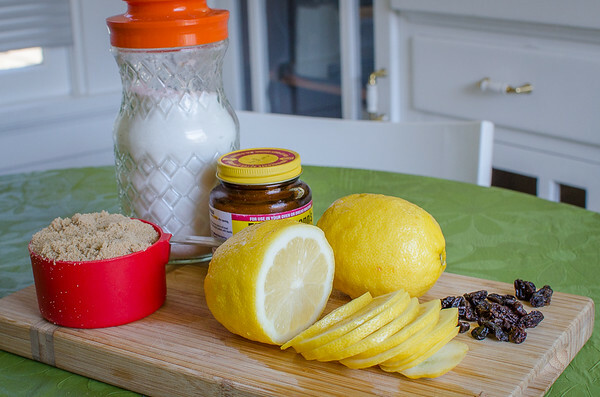 So when I came across this Finnish recipe for a fermented lemonade (oh, the things you find on Pinterest! ), I was surprised I hadn’t heard of it. This drink, called “sima” is traditionally brewed in Finland on May 1 to celebrate the arrival of spring. 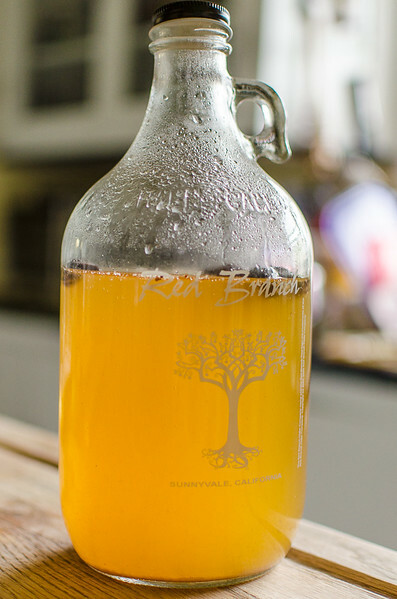 It’s the easiest recipe I’ve ever seen for a home fermented beverage, with things that you probably already have in your kitchen. I was curious about the use of ordinary bread yeast, and the purpose of the raisins–are they there for flavor? To provide more yeast/bacteria? Or just to let you know when its ready (because they rise to the top)? Who knows, it’s certainly a rustic recipe and I can easily imagine old Finnish grandmothers making it in their kitchens. It’s very slightly alcoholic (<1%), but gets more so the longer you ferment it. It was seriously effervescent and quite refreshing, though with a distinct yeastiness. I’m going to experiment with using other types of yeasts (beer starters, etc.) next time to see how it affects the flavor. At any rate, this Sima recipe is a good, easy introduction to the world of home fermentation, so give it a try and let me know what you think in the comments! Day 3, when I considered it ready and moved it to the refrigerator. The raisins had risen to the top and the pressure was intense when I opened the bottle. Add the brown sugar, 1 cup of the white sugar and stir to dissolve. Let stand at room temperature until the raisins have all risen to the top of the bottles. I left it two more days until I could tell it was very fizzy. Thanks to Girl Cooks World for the inspiration! What do you think of this recipe? And do you have a favorite “food experiment” of your own? In general I find cooking to be a bore (baking’s a whole different story), but experiments are the best. This looks like a fun one. I haven’t done any fermented beverages due to my lack of enthusiasm for beer, so this might be just the thing for me to try. kifer, do you know how to make homemade ginger ale, because if you do, i’d like to know how. also, what is your recipe for homemade yogurt? Larry, I have a great recipe for ginger ale syrup that you can then add to seltzer water (we have a SodaStream), but I’ve never bottle carbonated it. Here’s the recipe: http://howtomakesodapop.com/how-to-make-ginger-ale/ We are going to try brewing soda in one of Kevin’s beer kegs when it’s tapped out in a few weeks. I’ll keep you posted. And yogurt is super simple, here’s a recipe similar to what we do http://www.epicurious.com/recipes/food/views/Homemade-Yogurt-395111 I use a cheap yogurt maker, but I’ve heard you can also wrap the container in hot towels and put it in a small cooler. I alternate between using yogurt starter culture and the remainder of the last batch of yogurt. Flavor it AFTER you incubate it, not before. thanks, kifer. i will tell you what happens once i’ve implemented these recipes. one of EIT’s previous posts regarding skipping visiting paris’ louvre museum reminded me of the song “ain’t that pretty at all” by the late great warren zevon. also, regarding kitty’s allergies, perhaps she is allergic to the kind of dishwashing detergent/soap used to clean her food bowl and water dish, but that’s just a guess. And the dish soap is a possibility, but the major issue is is her seasonal allergies. We got her tested recently and she is very allergic to a few pollens that are common right now, I just need to decide whether it’s worth doing allergy shots or oral allergy meds. Of all the homeless cats in the world, why did I have to get the high-maintenance one? Interesting thread. My mom had an old oven she kept in the garage for making yogurt and jerkey. Looks fun. In answer to your question : why the raisins ? The raisins provide nutrients that are needed by the yeast. You can also use a powdered yeast nutrient available from winemaking supply stores. Raisins in fermented fruit drinks are not uncommon and add a nice roundness. I think that roundness would be welcome in a lemon drink. It dates back to the Roman days at least. Cheers ! Thanks for this, Carl! I had put a ton of (white and brown) sugar into the mix so I assumed that was what the yeast were eating, but perhaps they needed the natural sugars, too? Interesting! That’s what I’m leaning toward, too. I went to the beer & wine-making store the other day and shared the recipe with the guy there–he thought the raisins were there to round out the flavor and give it a nicer texture, more mouth feel? He said he knows some cider makers that use stone fruit like peaches and plums in their mash to do that. I’m trying a new batch right now with a packet of champagne yeast I picked up there, I’ll let you know how it goes! I have champagne yeast on my list now ! Thank you for posting such a nice article. I found your receipe via pinterest and wanted to share my favourite with enthusiast like you. It is an old blackcurrant leave flavoured version of Sima, called Louhisaaren juoma, “Louhisaari drink” or “Marshals champagne” named after it’s origin of estate Louhisaari where one of the Finnish presidents marshal Mannerheim lived his youth. Brewing method is like with Sima, some add the lemon when bottled some add up everyting at ones, but you just has to believe beverage is ready after one day as you don’t have the raisins showing when ready. This is best after couple of days in fridge. Hi Tiina, I’m sorry for not responding sooner, I somehow missed your comment back in January! Thank you very much for sharing this recipe! I’d love to try this, but I’m not sure I can find fresh blackcurrant leaves in California. I wonder whether there are any similar tasting leaves that I can find out here? Maybe blackberry or raspberry? I’ll talk to the berry guy at my farmer’s market and see what he suggests. Generally, in wild fermentation we use organic raisins or fruit lightly washed to provide the yeasts needed. All fruit has yeast on it’s skin, part of it’s normal flora, and this is how it ferments all by itself when it falls off the tree or vine. We don’t add bread or wine yeast, we allow the wild. Ya never know what you’ll get! Interesting, thanks for sharing that tip! Did you ever experiment with different yeasts? The first time I made this, I followed your recipe exactly. I didn’t care for it at first. Almost tossed it – too yeasty. But after a week in the bottles (refrigerated), it really mellowed out. Still smelled funky – but I grew to REALLY like it. I’m currently making my second batch and I used wine yeast instead of bread yeast. It’s going SLOW – but it does seem to be working – I think. I added the yeast after it cooled, but then let it sit for 3 days before removing the lemons – it still wasn’t hardly bubbly at all, but I did see a FEW bubbles sneak up – so figured it’d be ok. Added the raisins (and some craisins) last night. They were floating this morning and there was a LITTLE bit of pressure when I opened the bottle. I’m hoping it’s more fizzy this afternoon – if not I’ll let it go another day or two. Hoping it works. If not, I guess I’ll go back to the original. 🙂 Would love to know if you found any better quality yeasts that work well for this. Hi Jen! Thanks for sharing your experience! I agree, it’s a bit yeasty and I’ve been wanting to experiment with other yeasts but haven’t gotten around to it yet. I’m going to look for a winemaking supply store right now and see what I can find there! Thanks for the tip, let me know how it turns out! Jen, I’m trying a new batch right now with champagne yeast–I’ll let you know how it goes! Yeast needs a warm liquid in order to get established. Best is around 68°F (20°C, but it has to be warmer than 59°F (15°C). If you want a living organism such as yeast to grow, it needs a bit of warmth. This is a brew that won’t get a high enough alcohol concentration to kill the yeast. If you won’t be drinking it immediately, then most brewers add sulfites to kill off the yeast. If you do try the champagne yeast, holy cow, be sure to vent the bottles. That WILL get you enough alcohol to kill the yeast. At any rate, if you look, there should be a sludge of yeast at the bottom of the bottle. Carefully siphon the liquid off without disturbing that layer, and you get a much clearer tasting result. With champagne yeast, after it’s done fermenting you will likely have a very dry alcoholic beverage. To make it bubbly, you bottle it in sturdy bottles and add a small amount of warm sugar syrup per bottle, maybe a teaspoon. Then use a bottle-capper or do it in a Grolsch bottle to resist the fermentation pressure. Thanks for this! I really do like the taste of the most recent batch with champagne yeast, but you are right–it did build up a lot of pressure. I left the cap just sitting on the top so that it wouldn’t build up too much, but it didn’t build enough carbonation so I capped it and just released it every few years, but it built up a lot of pressure! It was a scary releasing it! The reason for putting raisins in the fermenting brew is for extra nutrients for the yeast. If when your fermenting it and you don’t have an airlock for your fermenter use a balloon over the neck of the bottle this will stop any explosions that may happen. Putting any thing that is fermenting in the fridge is called cold crashing and it is used for killing the yeast. D47 yeast is a great all around wine yeast can tolerate a vast range of temperatures. All good brew supply stores should stock it. Yes! D47 is what the guy at the wine supply story sold me! I just tasted my most recent batch and it is much better than with the bread yeast. Traditional recipes use honey in place of brown sugar. Organic raisins will provide the yeast (it occurs naturally on the skin) and that’s their original purpose in the recipe. If you don’t get fermentation starting, then add a bit of beer yeast. BUT WHATEVER YOU DO, do not cork or seal these bottles tightly! As yeast metabolizes sugar, it makes alcohol and CO2. That gas does carbonate the drink, but if you get too much it will shatter the bottle like a bomb. A better choice is to use a brewer’s vapor lock, or a balloon to cover the opening, to allow excess gasses to escape. Thanks for these tips, C.L.! I need to buy a vapor lock. Thanks for the reminder! You mean, use kombucha starter to make this Sima? Or use kombucha starter to make kombucha? The former won’t work, but if you were talking about getting started brewing Kombucha, I’d definitely give it a try! You can either buy a kombucha starter (sometimes called a “SCOBY” or “Mother”) from someone in your town if you can find them posted on Craigslist, or you can buy them from various vendors online. I bought this brand of kombucha starter before after finding it at a health food store near my house and it worked great! http://amzn.to/1GmFuzY (It comes with flavored tea for the initial batch, but on subsequent batches you can use whatever kind of black or green tea you want–just don’t use a purely herbal/caffeine-free blend, the infusion has to have actual tea leaf in it). Hi Cassie, thanks for posting this – a friend mentioned your article because he knew I was looking for spring fermentation recipes. I love finding ancient/rustic wines – this looks quick, easy, and wonderfully bubbly. I’ll be starting a batch tomorrow! Happy to inspire other fermentation enthusiasts, Russ 🙂 Let me know how it goes! I was reading Sandor Katz’ Art of Fermentation for more information on fermented sour tonic beverages and found this tidbit “One traditional way of gauging carbonation is to add a few raisins to each bottle of ferment you are seeking to carbonate; as the contents of the bottle carbonate, the raisins float to the top.” Looks like raisins actually serve multiple functions in fermented beverages! Thanks for the recipe, I am looking forward to trying it out today. Interesting tip! I don’t have that book yet, but it’s on my wish list! Let me know how the recipe turns out for you! Would an air lock used in wine making work better than having to open the cap every day? Hi Scott, I had to think about this one for a second, as I’ve used airlocks making beer before. In this case, I think that since Sima is a fizzy drink, using an airlock would allow the pressure to consistently escape, resulting in a flat beverage (like wine, or like beer before conditioning). Opening the cap regularly allows you to balance between having some pressure in the bottle during fermentation, and essentially creating a pressure grenade in your kitchen that would be capable of bursting and causing a mess (or hurting somebody). I grew up in a Finnish community in Northern Minnesota drinking Sima during haying season. Our neighbor would make the Sima and squeaky cheese and bring it over for an afternoon break for the farm crew. My sister and I made Sima last summer in an effort to remember our youth. We substituted the farms maple syrup for the sugar and grated the lemon peel (organic lemons) which brought out more of the lemon oils and enhanced the flavor. Wonderful memories of a wonderful time. Thankyou for this recipe. I made it a couple of weeks ago and found it so lovely. I’m making more today. My first time however, I had no brown sugar so I replaced it with mullberry pekmez syrup. It tasted good and lemony with an added toffee taste, and was extremely fuzzy even being kept in the fridge; I had one explodee. The brown colour of mine was a bit off-putting so this time I’m going to use honey as a replacement for the brown sugar which is hard to come by here in Turkey. I’m really looking forward to offering this lovely beverage to my guests in the summer. Once again thankyou.